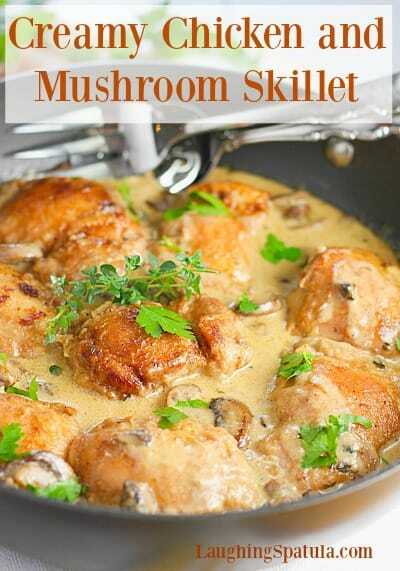 Creamy Chicken and Mushroom Skillet! – This amazing one skillet chicken dish will quickly become a family favorite! 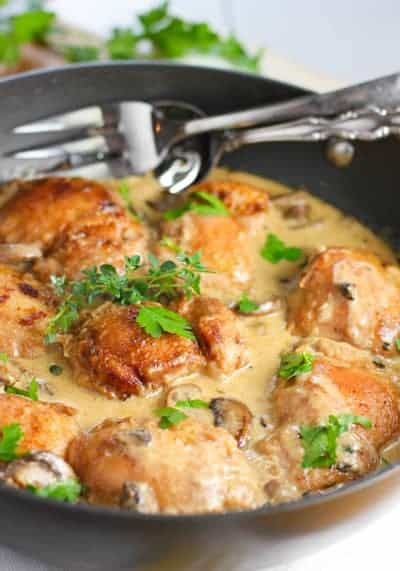 Seared chicken in a creamy mushroom sauce….yum! I am not a big ‘stand at the stove’ kinda girl. I like to toss everything on a baking sheet and shove it in the oven. But this went pretty darn fast. A quick sear, a bit of sautéing and it was done. I don’t think it took me 40 minutes (aka: two glasses of Chardy) to make the entire meal….and that I can live with! 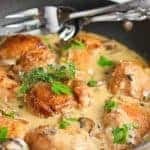 Tips to make Skillet Creamy Chicken and Mushrooms! You can sub boneless chicken breasts in lieu of thighs but reduce the cooking time by about 5-10 minutes so you don’t dry out the chicken. Chicken breasts are done when a meat thermometer reads 165 degrees. We used grated Asiago cheese, but you could certainly use parmesan or romano or a blend of both! If you want to substitute half and half for the cream, you may have to add a tablespoon of flour, combined with two tablespoons of half and half to thicken the sauce. Personally, I’d stick with the cream. But if half and half is what you have this method will work. If you just can not stand at the stove for a few minutes sipping chardy tonite…you might want to try One Pan Roasted Chicken and Sausage. Easy one pan meal with tons of flavor! You might like our super easy Pesto Stuffed Chicken Breasts as well! 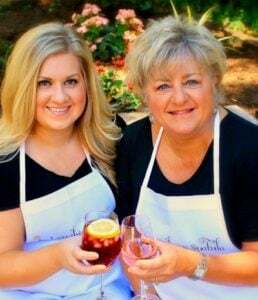 To chicken and all the wonderful things you do for us! I think it was a little too mustardy. I will definitely try it again but minus the mustard! Yikes! Well, I guess you either like mustard or ya don’t! The dijon is a natural emulsifier and helps the cream and juices come together along with giving it a depth of flavor. I think you would like it without but the consistency may be just a bit different. This looks delicious! But neither my husband nor I can stand thyme. Any suggestions for what to use instead? Hi Sarah – I think you could go herb free with this one. The real flavor is in the sauce and the mushrooms. If you feel you want to add a little something – a pinch of tarragon would be nice. It’s lemony and light. I made this tonight- I didn’t have cream or asiago cheese on hand – I used milk with flour, and Parmesan. Fantastic recipe!!! The Family loved it!! And it really is easy:) Thanks for sharing:) made it with mashed potatoes. I didn’t have cream, asiago or dijon, so I used a half a can of cream of mushroom soup mixed with milk and parmesan cheese. Came out good. What can I use instead of dijon mustard. Any recommendations for seasoning? Just leave it out. The cream and mushrooms should be enough flavor but the dijon does act as a natural emulsifier and helps the juices, butter and cream come together. You might notice a bit of difference in the consistency but I think you will still love it! Thanks for the note! well I can’t ask for a better note than that! Yay! Thanks for a delicious recipe. The thyme gave it a bite that was different from the norm. My children and I loved it. Btw, I pulled out the heavy cream, and it had spoiled, so I substituted sour cream, and I was still absolutely delish. I think the sour cream is a great idea! Like swedish meatball chicken casserole thingy! Great improvising! Tried your receipe tonight for dinner and my husband and I both loved it.It was kind of a lot of prep work, but the final product was worth it. I agree, this one is a little more time consuming than most of my recipes but it is so yummy! I’m glad you guys liked it.